I should have been entertaining my husband's cousins tomorrow, but we have had to call it off because of the snow. However, I had already bought all the stuff for this trifle recipe so I made it anyway. We will be eating it all week, but that isn't necessarily a bad thing is it? The recipe has been adapted from one in the Woman & Home Magazine supplement 'Tastes of Christmas'. 1. Place the trifle sponges in the bottom of the trifle dish. Cover with the peaches and the syrup from one of the tins mixed with the Amaretto or brandy. 2. Mix the caramel with the sea salt and pour over the peaches and sponge. Spoon the custard on top. Chill while you whip the cream. 3. 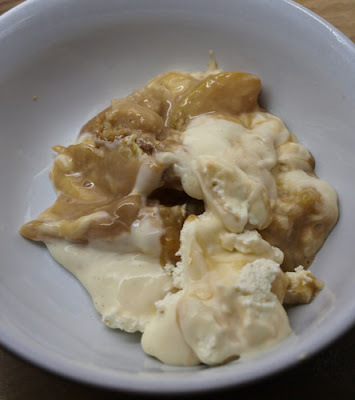 Whip the cream to soft peaks, spoon over the caramel. Chill for at least 30 minutes. 4. 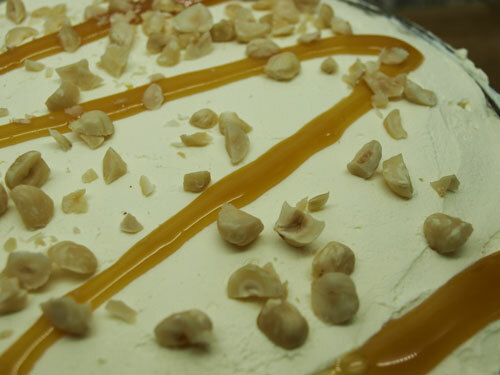 Just before serving, drizzle with toffee sauce and scatter the nuts over the top. I have to say it doesn't look that great in the bowl, but it tastes divine ...mmmmmm. Oh that does sound mighty fine to me. I bet your Husbands cousins are gutted they can't get through! That sounds right up my street! 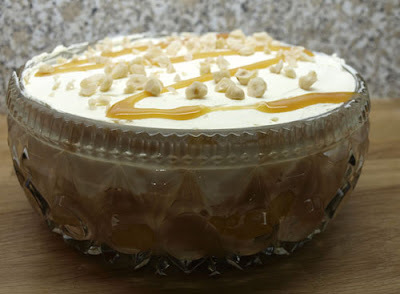 And trifle everyday is no bad thing..